Stunning newly renovated Maiella stone villa nestling in the beautiful Abruzzo countryside with a private pool and pool house. This fabulous 5* Maiella stone, old farmhouse is steeped in history, it has been newly renovated to an exceptional standard. 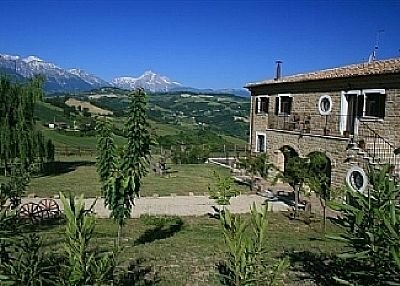 Set in the heart of the beautiful Abruzzo countryside with its own olive grove and stunning views of Gran Sasso. All upstairs bedrooms have en-suite shower rooms, bedroom 5 has a bathroom, bunk beds & twin beds.The recreation room/bedroom 6 is fully equipped with a double sofa bed, TV, DVD, Wii and Sky, an electric keyboard, games,books and exercise equipment including bike and weights. In the hall there is a piano and range of piano music. A small kitchenette with tea/coffee making facilities and day bed is situated on the landing.The 45 ft. kitchen with an American fridge/freezer, 6 ring gas cooker and all mod cons has been painstakingly renovated to create a fabulous living space with an inviting wood burner at one end and a fully equipped laundry room. The snug sitting room with another wood burner and Sky TV is designed for comfort and relaxation especially on those crisp winter days. The impressive 13.5m private pool with diving board and large pool house comes complete with a full-size table tennis table and drinks fridge. There is also a solar shower. The long shady enclosed veranda is perfect for relaxing and taking in the stunning views, it has tables and chairs for outside living and leads down to a huge terrace. The veranda is fully gated ensuring peace of mind for parents of young children. Portable barbeques are also supplied for your use. A shady pergola has been added to the west side of the house to provide extra shade. The closest town is Castiglione Messer Raimondo - a medieval hill top town. Atri and Penne are a short distance away and both have beautiful historic churches, piazzas, market days as well as supermarkets, banks etc. Silvi Marina has miles and miles of beautiful golden sand, fantastic restaurants and good facilities. For less developed areas go further north or south of Pescara to Roseto, Pineto or Vasto. Bedroom 4 has 3 single beds. Bedroom 5 has twin beds and bunk beds. Bedroom 6 has a large, comfortable double sofa bed. Stair gate and 2 highchairs also available.